Sheriff Al Lamberti and the men and women of the Broward Sheriff’s Office honored the memories of Deputy Philip Billings; Town Marshal John Clifton; Deputy Worth Edwards; Officer James Thomas; Fire Rescue Lt. Mark Freeman and Fire Rescue Lt. Rick Scorgie during a ceremony held at the Ron Cochran Public Safety Building on April 16. BSO Deputy Tony Morales (left) backs up Coconut Creek Police Officer Ryan Marken while conducting a traffic stop on I-75 northbound Friday during the Blitz on Aggressive Driving (“BAD”)enforcement. More than a dozen participating agencies use conventional and unconventional unmarked cars for the crackdown. Officer Marken drives a Mustang GT, while Morales drives an unmarked Dodge Charger. In all, 189 tickets were issued in the eight hour period. Broward Sheriff’s Office Deputy Tony Morales is interviewed by a TV news crew from Spanish language channel Telemundo 51 on the Sawgrass Expressway on February 6th. Operating a Laser to determine motorists’ speeds is BSO Sgt. Allen Adkins, in the background. The BSO Regional Traffic Enforcement Unit and Florida Highway Patrol Troop L- Davie and Troop K-Broward Turnpike launched the joint enforcement effort in March, 2008. Nearly two dozen deputies and troopers participated in the speed and “Move Over Law” effort in western Broward on the Sawgrass Expressway and along Interstate 75 in Weston. Statewide, as of February 1, the fines for traffic infractions have increased. In Broward County, a Move Over Law violation now carries a fine of $150.00, up from $122.50. Speeding fines vary based on the number of miles over the limit, but now run $265.00 for exceeding the limit by 20 miles. Deputy Pat Darmody is always on the look out, but he didn’t have to look too hard to find a trio wanted for burglary after hearing a BOLO of the suspects’ descriptions over the airwaves. Shortly before 7 a.m. on Thursday, January 22, Tiffany Patterson stopped at a RaceTrac gas station on McNab Rd. in North Lauderdale to buy gasoline. As she went inside the store, she looked back at her 2003 Volkswagen Bug to get the number of the gas pump and noticed a man opening her car door. Patterson immediately began walking back toward her car yelling at the man to get away from her vehicle, but the man quickly grabbed her purse and began running. Patterson gave chase but then stopped and tried to remember as many details as possible about the suspects and their getaway vehicle. Once deputies arrived on scene, a BOLO was issued for a light tan Nissan Maxima along with the female and two male occupants. North Lauderdale Deputy Pat Darmody heard the BOLO and recognized the description as that of three suspects he’s had previous contact with. Deputy Darmody drove to a location where he thought he could find the group. His hunch paid off! As he pulled up to the 1200 block of SW 71 Terrace he spotted the Maxima parked in front of one of the suspects’ home with the three suspects still sitting inside. As a result, the victim was able to recover her purse and most of her belongings. Thanks to Deputy Darmody’s quick action, he also helped get a break in other burglary cases. The trio was found to be in possession of two GPS devices, which North Lauderdale Detective Lisa Sokol determined had been stolen during two separate vehicle burglaries in Tamarac. BSO Detective Maury Hernandez throws the first pitch! Broward Sheriff’s Office Detective Maury Hernandez (with brother Josue) prepares to throw the ceremonial first pitch at the Margate Youth Baseball League season kickoff on Saturday morning. Hernandez’s pitch was caught by Florida Marlins catcher Matt Treanor. Team mascot Billy the Marlin was also on the ball field. The Margate Youth Baseball League has over 650 kids from ages 4 to 16 playing on 53 teams. The league also holds the distinct honor of winning two state titles, a first for any league statewide. In their last season, they won the Mustang Division (9 and 10-year-olds) and Bronco Division (11 and 12-year-olds). The winning Bronco Division coach: league president (and Broward Sheriff) Al Lamberti, who has served as league president for seven years. Saturday’s Jamboree Celebration included rides, food, games and a display by the Margate Police Dept. and Broward Crime Stoppers who took DNA samples and fingerprinted kids for their parents’ safe keeping. Hernandez was critically wounded back in August, 2007 after being shot by a fleeing suspect in Pembroke Park. 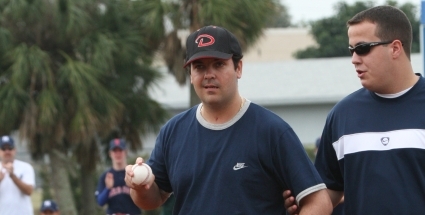 Comments Off on BSO Detective Maury Hernandez throws the first pitch!